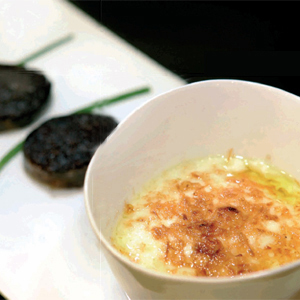 Recipe from the Marisol Arriaga restaurant, Logroño (La Rioja). Clean the cauliflower and cook in boiling salted water. When cooked, drain, and then add the butter and cream and season to taste. Blend until you have a smooth purée. Slice the black pudding into rounds and bake for 5 minutes at 210°C. Place the cream in a bowl or on a plate. Sprinkle with grated cheese and pop under the grill. To serve, place the black pudding slices on the side.